We like to say that an environment – for any building type – is not an innocent bystander. The environment will either support your mission or frustrate it. It won’t be neutral. When applied to Blended Learning, the stakes are higher than normal because of the disproportionate scrutiny and demand for early results by those invested in the status quo. This scenario is true for any disruptive advancement in any industry, so attending to every detail that can improve efficiency is vital. For school districts just dipping their toe in the Blended Learning water, there is a strong tendency to adapt environments they know well or already own. Often times, practitioners are just happy to have a space and to be given a chance. What often results are spaces that frustrate success because they increase stress for the participants rather than reduce it. No one needs an explanation for how a traditional classroom functions. There is a clear order, an understandable hierarchy, and orienting landmarks. All these things evaporate when a new functional model is introduced – particularly if walls are knocked down between traditional classrooms to create a larger space. We’ve designed environments for the Station Rotation and Flex models of Blended Learning, which can easily serve for the Individual Rotation model, too. In doing so, we’ve relied on the same principles that make any human environment comprehensible and navigable – order, hierarchy, and landmarks. 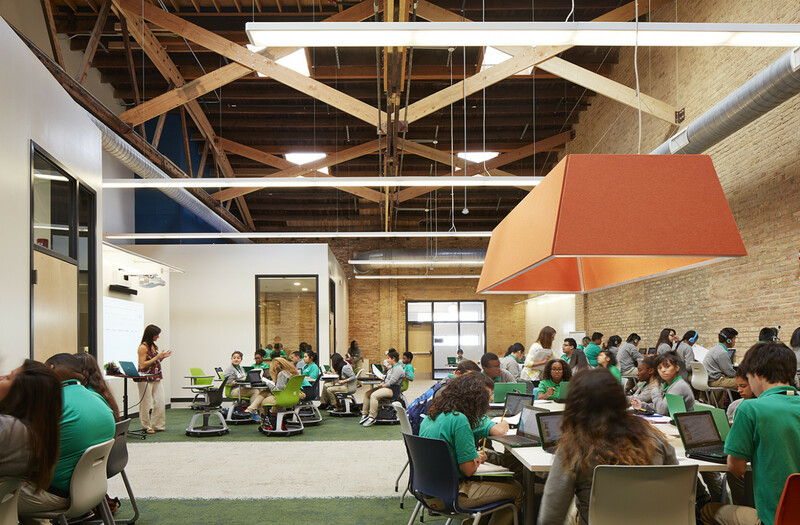 Ideally, students should be able to identify and intuit the purpose of different spaces within the Blended Learning environment as they execute the choreography required during a typical day. The ultimate goal is not just to have every student identify with the spaces in the environment but to have them actually emotionally attach to these spaces, creating a sense of belonging and purpose. The antithesis of this approach is the open plan school of the 1960s, which sought to provide universal space that could accommodate a multitude of activities anywhere in its footprint. In our experience, these universal spaces suffered from the Flexibility Paradox. Although these hyper-flexible spaces could accommodate just about any activity, they weren’t particularly good at any one activity. Consequently, these spaces were underutilized and sometimes orphaned. No one felt ownership. To avoid these pitfalls in a Blended Learning environment, we’ve developed a series of identifiable zones that participate in the daily choreography of highly personalized learning. Beyond their ability to host different learning modalities, these zones give the instructors and students a common understanding of their inherent purpose. The Coastline– This zone accommodates individually focused student work, both online and offline. It is characterized by a continuous row of desks or long worktops, arranged along the perimeter of a space. Ideally, the worksurfaces dock against a dinstinctive colored dry erase surface that serves as a landmark and allows students and faculty to make ephemeral notes. The worksurfaces should vary in working heights, ranging from traditional desk height to standing height or bar stool height. When students are working online, instructors can easily scan the student screens along the coastline without disturbing them. Exchange Tables or X-Tables – This zone accommodates collaborative peer to peer learning. It is characterized by movable tables, sized to accommodate a minimum of four students, that can also be ganged together to create larger surfaces. Ideally, these tables are located beneath large light fixtures, whose shades serve equally as landmarks and sound absorbers, while creating the intimate feel of a social environment like a café. To be most effective, these tables should have identifiable tops, perhaps of a distinct color. The tops of these surfaces can be dry erase if desired. Pop-Up Class – Typically, there can be multiple Pop-Up class zones in a Blended Learning environment, which serve as venues for Mini-Lessons for up to ten students and an instructor. Ideally, these spaces are outfitted with a whiteboard, smartboard, and rolling chairs with desks that can be quickly grouped for an impromptu online or offline lesson. To be most effective, the footprint of this area should be characterized by a unique flooring color to conceptually contain the activity. Seminar Room or Lab Room – This zone approximates the traditional, acoustically separate classroom. Ideally, this “room within the room” is characterized by interior windows that alleviate the sense of confinement and heighten the sense of belonging while still protecting the independence of the room activity. Typically, these spaces can be outfitted for direct instruction with a white board or smartboard and augmented with purpose designed furnishings. These spaces can accommodate the largest student groupings and the commensurately louder voices necessary for effective communication. Genius Bar or Genius Top – Borrowed from the Apple Store lexicon, this centrally located landmark is a bar height table where at least one instructor is always seated on a high perch for easy supervision and accessibility to students. Ideally, this area has a high worksurface with bar stools and low storage for instructor belongings. The table supplants the traditional teacher desk and can be sized to accommodate more than one instructor. These zones, regardless of naming convention, seek to serve the typical modalities found in a Station Rotation or Flex Blended Learning model while creating an intuitive low-stress environment for students and instructors. Once these zones are comprehensively understood, instructors can manage the learning instead of the choreography.